India's current political season has a nostalgic tint. Congress Vice-President Rahul Gandhi has apparently met party leaders to kickstart a campaign against the National Democratic Alliance’s (NDA’S) overt efforts to softly kill the erstwhile government’s flagship programmes. Particularly, the NDA government’s political decisions to not pursue the Mahatma Gandhi National Rural Employment Guarantee Act (MGNREGA) and dilution of the Forest Rights Act (FRA), both of which are crucial for large numbers of rural Indians. As a strategy, Gandhi wants to take advantage of the fact that both schemes are celebrating their 10th anniversary and there is wide public attention on their fate. From poll-bound Kerala to Odisha’s remote districts, Congress workers are demanding the schemes’ implementation. 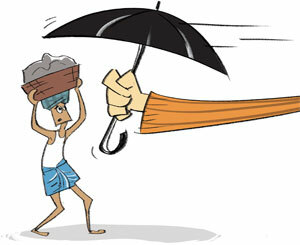 Civil society groups are more vocal now on the schemes’ dilution. One can become nostalgic about the first United Progressive Alliance government that rolled them out. But on the day MGNREGA completed a decade, the NDA government behaved unexpectedly. Immediately after Gandhi’s office released the Congress’s plan to launch a nation-wide campaign for MGNREGA, the corridors of the Union rural development ministry saw unusual activities. The Prime Minister’s Office asked for a ªmegaº celebration of the 10th anniversary. Finally, the programme that Narendra Modi infamously termed ªthe monument of failureº in Parliament, is now the ªnational prideº that warrants a mega celebration. What could be the reason for such a turnaround? It is politically untenable that Modi reacted to Gandhi’s usual anti-government stand with such a massive change of heart for MGNREGA. But it can be politically argued that finally the political economy of welfare has caught up with the NDA that has been more focused on economic growth through economic liberalisation and industrialisation. Also, it seems that the government, which completes two years in May, is waking up to a rural economic crisis that is fast slipping out of control. The first two years of not pursuing MGNREGA that has pumped in more than Rs 2,00,000 crore in cash as wages for rural populations in the last one decade has definitely hampered rural consumption capacity. This, in turn, has impacted national economic growth. A second consecutive monsoon failure in 2015 and dipping rural income have precipitated a deep crisis. For an alliance that has been losing elections one after another, it is more of a political course correction than a genuine shift in policy focus. It is clear that the MGNREGA has been a saviour during 2009 and 2015, both drought years, when people largely depended on MGNREGA to compensate for income loss in agriculture. By celebrating MGNREGA, the NDA has tried to take the first step to fight the perception battle it has already lost; Gandhi calls it the ªsuit-boot-ki-sarkarº. The celebration coming just before the budget indicates that the government will be giving generous allocation to the programme. This will help it arrest the political fallout of ignoring MGNREGA. Both West Bengal and Uttar Pradesh are going to the polls and are major beneficiaries of it. Whatever the reason, MGNREGA has got back the political backup it deserves. The programme is a solid instrument of security for rural people, 70 per cent of whom have an expenditure capacity of less than Rs 20/day. Modi needs to change his attitude towards MGNREGA. During that infamous parliamentary speech, he said digging ponds was an inferior job and hurts the image of a modern India. MGNREGA’s biggest contribution, besides transferring cash wage, has been to equip villages with these ponds that fight drought better than government machinery. In a drought year, Modi needs to show maturity and political statesmanship by recognising this. it might be instructive to understand that narendra modi did not call it a failure. he called it a monument to congress's failure to develop the nation. essentially he said that had the congress developed the nation, there would not have been a need to have a program like MNERGA. you are free to write against narendra modi, but at least get the facts right for the sake of a logical and mature debate on an important issue. do watch the video - https://www.youtube.com/watch?v=wi037kOLaP4 - he says "mnrega aapki viphaltaon ka jeeta jagta smarak hai" - he does not say mnrega is a failure, he says it is a monument to your failures.